With the 12th edition of the Indian Premier League just less than five days away, the teams have started preparing for the exciting T20 tournament. The opening game of the IPL 2019 will be played between Chennai Super Kings and Royal Challengers Bangalore in Chennai at the Chinnaswamy Stadium on March 23, 2019. Both teams have been sweating it out in the nets ahead of the first game. 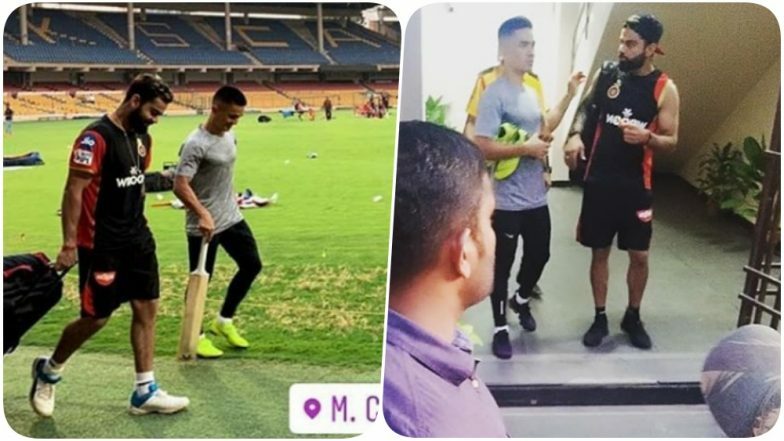 Now, yesterday, Indian football captain Sunil Chhetri joined the training session of the Royal Challengers Bangalore. Chhetri who plays for the football franchise Bangalore FC in the Indian Super League walked away with the ISL 2018-19 title this year. Sunil Chhetri Dubs Bengaluru FC’s Maiden Indian Super League 2019 Title Win As ‘Special’. Bangalore FC went on to beat Goa FC 1-0 in the finals if the Indian Super League 2018-19. The Indian football captain has scored nine goals in has implemented three assists in 19 games. As Chhetri joined the RCB camp, Virat Kohli was seen introducing him to the team. “Those of you who don't know, that's Sunil Chhetri the captain of our national football team. He's just joining on the field today. Any of you want to chat to him about your mindset or anything.. main man. Let's make him feel comfortable and welcome," Virat Kohli said introducing Chhetri to his teammates.” IPL 2019 Schedule in PDF for All Matches: Download VIVO Indian Premier League 12 Full Timetable With Fixtures, Dates, Team and Venue Details. Chhetri also wished the team good luck for the upcoming season of the IPL 2019. The video of their meeting went viral. The Royal Challengers Bangalore has never won a single IPL title so far in the history of the T20 league. Surely the team would want to put their best foot forward for the IPL 12. Team RCB boasts of a strong batting lineup with names like Virat Kohli, AB de Villiers, Shimron Hetmyer, Heinrich Klaasen and Marcus Stoinis.